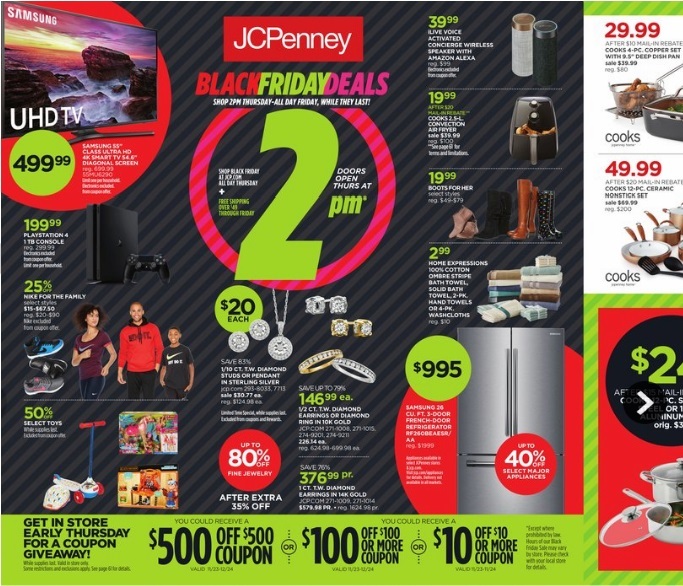 JCPenney released its 2017 Black Friday Ad and announced that its doors will open for its annual Black Friday Sale at 2 p.m. on Thanksgiving Day. When stores open on Thanksgiving Day, early shoppers will be greeted with an envelope containing a coupon worth $10 off $10, $100 off $100 or $500 off $500 or more purchase, while supplies last. Coupons are valid for use in stores only starting on Thanksgiving Day. Stores will continue to remain open for the retailer's Black Friday sale until Friday, November 24 at 10 p.m.
Store customers on Saturday, November 25 will also be treated to a $10 off $10 or more coupon giveaway while supplies last.